The Levy Institute, with underwriting from the Labour Institute of the Greek General Confederation of Workers, has helped design and implement a program of direct job creation throughout Greece. Two-year projects, financed using European Structural Funds, have already begun. This report by Senior Scholar Rania Antonopoulos, President Dimitri B. Papadimitriou, and Research Analyst Taun Toay traces the economic trends preceding and surrounding the economic crisis in Greece, with particular emphasis on recent labor market trends and emerging gaps in social safety net coverage. Overall, the report aims to aid policymakers and planners in channeling program resources to the most deserving regions, households, and persons; and in devising data collection methodologies that will facilitate accurate and useful monitoring and evaluation systems for a targeted employment creation program. On its own, the report provides an excellent in-depth portrayal of the evolution of the Greek economy since joining the euro and traces some of the harrowing challenges ahead—particularly in youth employment (the youth labor force participation rate is 20 percent below the OECD average—what’s happening in Greece will truly mark an entire generation). For those interested in the policy side, the report also provides a solid introduction to the conceptual justification behind a direct job creation program along the lines of Hyman Minsky’s “employer of last resort” idea (beginning on p.33 of the report), while also detailing some of the nuts-and-bolts monitoring and evaluation aspects of making this kind of policy work. The ‘fiscal compact’ assumes that an upper limit of 3 per cent of GDP is consistent with a near balanced structural budget despite the swings in economic activity and associated swings in budget deficits as the automatic stabilisers take effect. As a rule of thumb a 1 per cent fall in GDP below trend leads to around a 0.7 per cent rise in the budget deficit – hence a more than 3 per cent drop in GDP before trend with a structural deficit of 0.5 per cent would lead to a country breaching the limit. 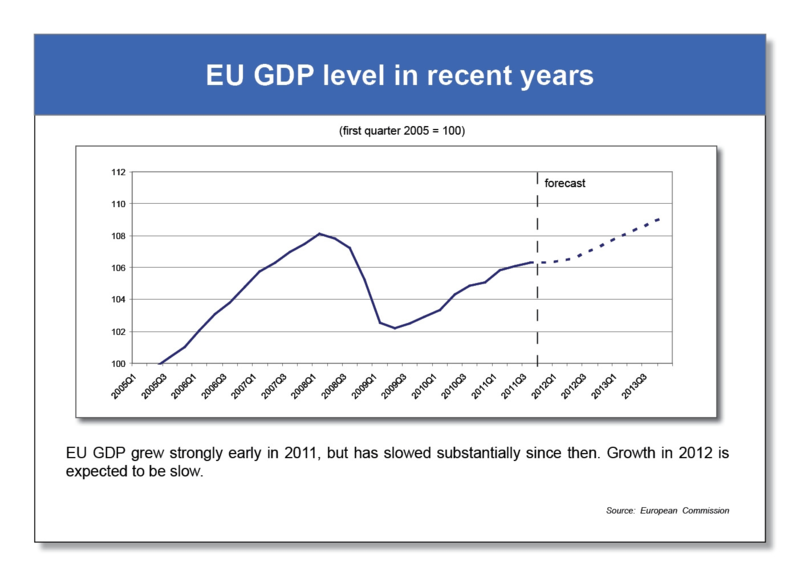 Note that this is a drop in GDP below trend – and could come from an actual drop of more like 1 per cent (with a 2 per cent trend growth rate). ANNANDALE-ON-HUDSON, N.Y. — Responding to a revolution in business strategy and to rising student demand, Bard College announces the creation of a new Master of Business Administration in Sustainability Program. Based in New York City, the new MBA in Sustainability responds to the dramatic surge in demand for training in sustainable business practices being created by green start-up businesses and major corporate efforts, such IBM’s Smarter Planet and General Electric’s Eco-Imagination. The two-year program, which will start in fall 2012, is being developed as a partnership between the Bard Center for Environmental Policy (Bard CEP), which grants M.S. degrees in environmental policy and in climate science and policy, and the Levy Economics Institute of Bard College, a leading nonpartisan economic policy research organization. “Bard is proud to make a substantive contribution to such an important field,” said Bard College President Leon Botstein. The Bard MBA in Sustainability provides a rigorous education in core business principles, as well as sustainable business practices, with a focus throughout on economics, environment, and social equity. Green companies must achieve quality production and performance, efficient operations, sound financial management, deep employee engagement, responsible and effective marketing, creative responses to changing economic conditions, flexible strategies, and continuous innovation. In courses on leadership, operations, marketing, finance, economics, and strategy, students will be constantly challenged to integrate three goals: profit, continuous reduction in ecological impact, and stakeholder engagement. The Bard MBA is structured around five weekend intensives every term (four in New York City and one in the Hudson Valley), with additional instruction between intensives. The program’s innovative residency structure—with classes held over long weekends once a month—will enable students and professionals from across the East Coast to attend and will allow regional and national leaders in business sustainability to engage students in the classroom. The New York City campus will become a laboratory for first-year students, who will participate in yearlong consultancies with New York–area businesses, government agencies, and nonprofits. Bard MBA faculty and guest lecturers will include leading scholars in business, economics, and environmental policy from Bard’s full-time faculty as well as cutting-edge practitioners in business sustainability, corporate and nonprofit leaders, journalists, and consultants. Randall Wray has a new one-pager following up on the release of a report detailing and tallying up the Federal Reserve’s extraordinary efforts to prop up the banking system—a report with the rather eye-catching headline number of $29.6 trillion. The Levy Institute working paper, the first in a series, is part of a Ford Foundation-supported project undertaken by James Felkerson and Nicola Matthews under Wray’s direction. In the one-pager, Wray explains the methodology and justification behind the report’s presentation of the raw data that was released (after some persuasion) by the Fed. As an example, he runs through the numbers for just one facility, the Primary Dealer Credit Facility (PDCF) created in March 2008, and explains the three different measures compiled by the report. First, they present the peak outstanding commitment (loans and asset purchases) at a point in time ($150 billion); then the peak flow of commitments over a week ($700 billion); and finally, the cumulative total over the life of the facility ($9 trillion). Again, this is all for one facility (PDCF). Take your pick: the appropriate number chosen depends on the question asked. The smallest number answers the question, What was the Fed’s peak exposure to losses (assuming the Fed would let the institutions fail without extending even more credit to them)? The middle number indicates how much it took to meet liquidity demands during the worst week of the crisis, from the point of view of the dealers. And the biggest number tells us how much the Fed had to intervene over the life of the facility in order to settle markets. Reading through the report, one can’t help but be struck by the contrast between the Fed’s fierce and, let’s say, imaginative approach to the banking crisis and the institution’s comparatively tame, chin-stroking acceptance of the needless waste of human potential represented by near-9 percent unemployment. While Mulligan states, correctly, that “[e]stimated job separations among employees ages 25-54 were 33 percent greater in 2009 than they were in 2007,” he stumbles into trouble by asserting that “the low employment rates for young people since 2007 are almost entirely explained by low hiring rates.” While the latter statement is true, it is also true, and conspicuously absent from Mulligan’s piece, that hiring rates fell as much for older workers as for younger workers. Figure 8 of the Elsby, Hobijn and Sahin paper clearly shows this dynamic: hiring has dropped precipitously for all age groups since 2007, while separations increased by much more for older workers and remains higher than the 2007 level. Before the recession began, quits were by far the most common type of separation; now the number of quits about equals the number of layoffs. As I reported here and over at Great Leap Forward, a new study by two UMKC PhD students, Nicola Matthews and James Felkerson, provides the most comprehensive examination yet of the Fed’s bailout of Wall Street. They found that the true total cumulative amount lent and spent on asset purchases was $29 trillion. That is $29,000,000,000,000. Lots of zeros. The number is quite a bit bigger than previous estimates. You can read the first of what will be a series of reports on their study here. I want to be clear that this is a cumulative total—and for reasons I will discuss in this post it is the best measure if we want to understand the monumental Fed effort to restore Wall Street to its pre-crisis 2007 glory. It is certain that no government anywhere, ever, has committed so much to benefit so few. Wall Street owes the Fed a big fat wet kiss. That’s a kiss Chairman Bernanke apparently does not want. Last week he extended the Fed’s veil of secrecy over its bail-out of Wall Street by trying to counter a recent Bloomberg analysis of the extent of the Fed’s largess with a fog of deceit. Apparently the Chairman forgot the lesson we learned from Watergate: the cover-up is always worse than the original indiscretion. Bloomberg had found that the Fed committed $7.77 trillion to the biggest banks. Bernanke provided a memo that claimed the real total was only $1.2 trillion. The memo went on to argue that much of the Fed’s lending benefited small banks, recipients of student loans, and even manufacturing firms like Harley Davidson. Finally, it claimed that throughout the bail-out, the Fed’s actions were transparent, with Congress continually updated on the Fed’s actions. It was quite a performance, reminiscent of the kind of misleading statements the previous Chairman, Alan Greenspan, made before the House under interrogation by the late, great, Representative Henry B. Gonzalez. Gonzalez—trying to shine a bit of light into the Fed’s secret meetings—asked whether the Fed kept tapes of its FOMC meetings (shades of Watergate). Greenspan fibbed, answering “no.” Realizing that it is not a good idea to lie to Congress, he went back to the office, convened a conference phone call of Fed officials and warned them that they likely all would be called before Gonzalez’s committee. He said it would be up to them to decide to tell the truth, or to continue the charade. However—and this is a real scandal—the Fed is routinely shredding the original transcripts (only the edited versions are available). You see, the Fed claims that because it is “independent”, it is not subject to normal “sunshine laws” that require maintaining government records. And its meetings that discuss monetary policy and bank supervision are also exempt from sunshine, according to the Fed. But that is a topic for another day even though it should be infuriating to Congress. Consider the current financial crisis in Greece. The country has experienced distress due to mounting government debt. European officials recently reached a tentative restructuring agreement. Under the agreement, Greece will undergo a strict austerity plan to regain solvency and Greece’s creditors will receive a reduction in their interests. Whether this restructuring agreement constitutes a “credit event” will likely be contested. Decisions like this as to whether a “credit event” has occurred are made by the International Swaps and Derivatives Association (ISDA) Determinations Committee—but as Hauptman points out, the ISDA committee includes representatives of financial institutions (some of the largest banks and hedge funds) that often have a stake in whether payments are triggered. For those who are paying attention to the meltdown in Europe, credit default swaps are likely to make a dramatic reappearance. Bloomberg reports, for instance, that European banks are selling CDS on their own member-nation’s debt (via Zero Hedge). Banking on failure indeed. In our latest Strategic Analysis we estimate that a cut in the general government deficit in the United States would have strong adverse effects on unemployment and a relatively smaller impact on the U.S. public debt-to-GDP ratio, since GDP would slow down with a cut in government expenditures and transfers. A similar strategy of deficit reduction seems to be on the agenda for many eurozone countries; notably Italy, where a new government was recently put in charge to implement unpopular tax increases that the Berlusconi government was not willing to adopt. A comparison of our simulation for the U.S. with the European Commission’s for the eurozone may therefore be interesting. First of all, the United States is now (third quarter of 2011) back to the pre-recession level of output, as measured by real GDP. Using this figure we could say that the recession is behind us, and we can plan for the future (although this is far from true if we look at the unemployment rate!). And in our projections we show that an acceleration in aggregate demand is needed if the unemployment rate is going to be reduced (the green line), while policies to cut the government deficit will lead to stagnation (the red line) and an increase in unemployment. 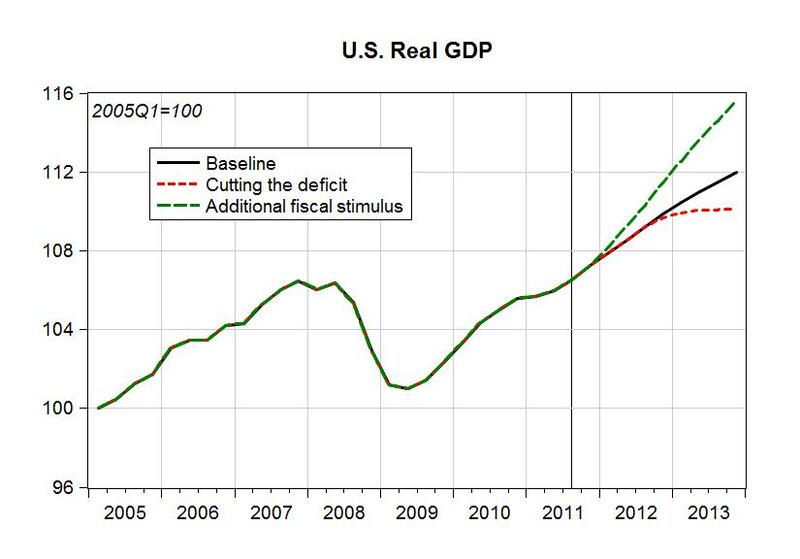 Real GDP in the area is still below its pre-recession level, and stagnating. We would think that European governments would be meeting frequently to discuss how to recover the lost ground in output and employment, but instead they meet with quite a different problem in mind: how to enforce balanced budget rules on national governments. The Italian government, still one of the largest economies in the area, is now passing a bill that will increase taxes substantially, further depressing domestic demand. What the EU is planning is the wrong policy at the wrong time. And if the multiplier in the EU is similar to what we estimate for the United States, the consequences for the unemployment rate will be substantial.